Aloe vera has been one of the most important plants used in folk medicine. The Egyptians referred to aloe as the "plant of immortality" and included it among the funerary gifts buried with the pharaohs. The healing benefits of aloe were recognized in the ancient Indian, Chinese, Greek, and Roman civilizations. It is traditionally used to heal wounds, relieve itching and swelling, and is known for its anti-inflammatory and antibacterial properties. Aloe Vera, or Ghrita Kumari in Sanskrit, is a member of the lily family and is very cactus-like in its characteristics. It is one to two feet tall; and its leaves are succulent, broad at the base and pointed at the tips, with spines along the edges. These fat leaves contain the clear healing gel that is 96% water. The other four percent contains 75 known substances including Vitamins A, B, C, E, calcium, amino acids for protein building, and enzymes used in the digestive system. 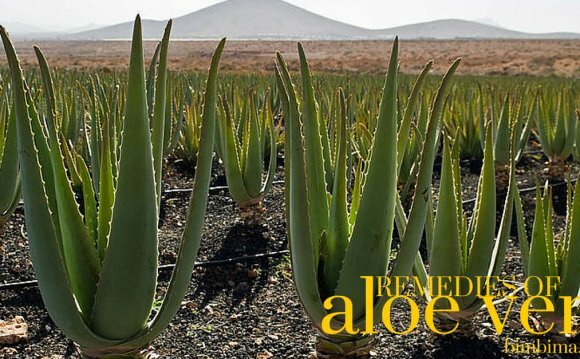 There are over 240 species of aloe, however only 3 or 4 of them have medicinal properties; the most potent one is Aloe Vera Barbadenis. Native to North Africa and Spain, this plant now also grows in the hot dry regions of Asia, Europe and America. Light burns and wounds: Cut off an aloe leaf and apply the gel several times a day. Mild sunburn: Mix 70% aloe vera gel and 30% bentonite clay. Apply paste on affected areas and wash it off after 15 minutes. In addition to the skin, other epitheliums in our body include the lining of the gut, the bronchial tubes and the genital tract, which also benefit from the healing effect of aloe vera. When taken internally, aloe vera juice aids the digestion and absorption of nutrients, helps control blood sugar, increases energy production, promotes cardiovascular health, improves liver function, and boosts the immune system. For balancing digestion and elimination: Take 1 tablespoon aloe vera gel in the morning on an empty stomach. Aloe helps clear the toxins out of the digestive system, facilitates digestion and improves the functioning of the kidneys, liver and gall bladder. The anti-inflammatory fatty acids in aloe alkalize the digestive juices and prevent acidity-a common cause of indigestion. These fatty acids benefit not only the stomach but the small intestine and the colon as well. Skin problems: Since aloe vera purifies the body and aids liver function, it is beneficial for the skin when taken internally. Take 1-2 teaspoons fresh aloe gel daily for young and healthy skin.